A few months ago, my friend, Annie introduced the idea of a monthly cooking club. Every month, a group of foodie friends and I get together at one of our homes to create a potluck dinner, focused on a specific cuisine. We’ve “traveled” to Vietnam and India, and our most recent “stop” was a TBD “destination” at my home. While Greek and Italian foods are always fun, I decided to choose a type of cuisine outside of my comfort zone: Moroccan. Leading up to the dinner, I researched a bit about the region. Moroccan food combines Arab, Jewish and Berber influences and showcases a myriad of warming spices and complex layering. A common main dish usually includes dried fruits, stewed meats, hearty vegetables, rich spices, cooked in a tagine (an earthenware cooking vessel) and served over couscous. 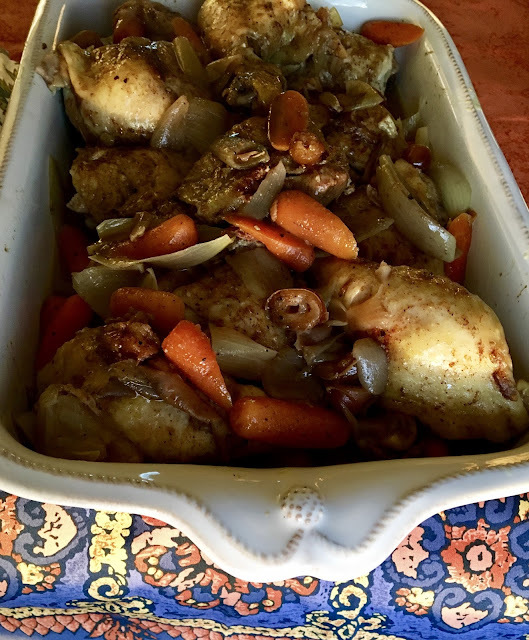 After finding some Ras el Hanout- a common Moroccan spice blend- at Boston Public Market, I decided to make a chicken dish featuring the pungent spice mix. I added dates, shallots and carrots and allowed the flavors to stew in the oven, accompanied with a side of fluffy couscous. 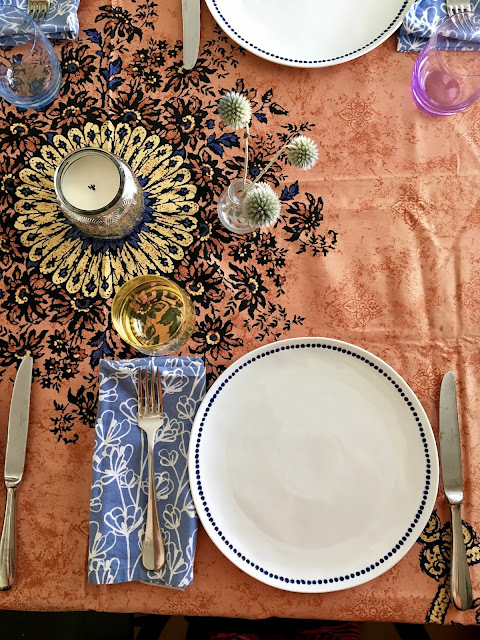 I set my table with deep red, gold and ochre fabrics, assorted candles and mismatched glasses. As my friends rolled in with their aromatic Moroccan dishes (carrot and chickpea salad, lamb tagine with apricots, homemade naan, and pistachio cake), we enjoyed a taste of a Morocco in quiet Connecticut. Arrange the chicken legs on a rimmed baking sheet and liberally sprinkle each side with salt. Cover with plastic wrap and chill for a few hours. In a small mixing bowl, submerge the halved dates in hot water. Let them sit for about 15 minutes until they become slightly plumped. Drain the dates, and set aside until the end. Heat 1 Tablespoon of EVOO in a large skillet over medium-high heat. Add half of the chicken (3 legs) to the skillet and sear until golden, about 5 minutes per side. Once browned, place the legs in a heavy roasting pan and add the remaining chicken legs to the skillet to sear. Once all the chicken pieces have browned, sprinkle a dusting of ras-el-hanout on each chicken leg. Meanwhile, add another 2 Tablespoons of EVOO to the skillet and add the carrots, shallots, garlic, thyme, lemon peel, ras-el-hanout, chicken broth, and white wine. Bring to a boil, whisking up the browned bits. Remove the skillet from the heat and pour the mixture over the chicken in the roasting pan. Place the roasting pan over the medium heated burner and bring to a simmer. Cover with pan with aluminum foil and place in the oven to cook for 1 hour. Transfer the cooked chicken, carrots, and shallots to a baking sheet. Pour the pan juices into the large skillet and spoon off any layer of fat from the surface. Heat the juices in the large skillet to medium-high until the mixture has reduced and thickened, about 15 minutes. Stir in the dates and red wine vinegar and cook until the dates are just heated through, about 3 minutes. Serve immediately with a side of couscous. Serves 6. Looking forward to our next themed dinner! Where will we go next?